12.09.2005 - I got a call about a smell in a wall in a hall at the mall. A rat did crawl, and then it did fall, and it curled in a ball, and it did not stall, if I recall, to offend all. With its smell, which smelled bad. I sniffed it out, then cut it out, then took it out, then looked about, and the people at the mall wondered what mistakes I had made in my life to be the guy who cuts dead rats out of the wall in the hall of the mall. But darn it all, I like my work, and if you don't like it, you're a jerk. I'm writing this way because I'm tired and my brain is nearly expired. When I can't write things of substance, I usually start making dumb rhymes. Okay, I'm forcing myself awake. In this particular case of dead animal removal, I once again had to work very hard sniffing the building. It's difficult to pinpoint the source of the odor. The whole place stinks. I basically have to sniff everything like a dog, until I find it. Then I cut a hole in the wall, remove and decontaminate, and then I fix the hole. That's about it, really. It's easy to describe, but difficult to do. 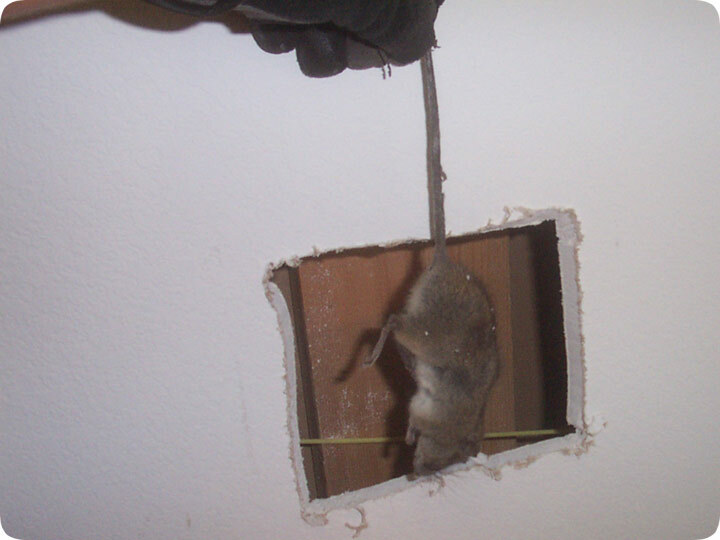 How to remove dead rat odor -The best method to remove dead rat odor is to make sure the animal has been removed from the building. You cannot get rid of the smell until the body is gone. “Gone” can mean removed by you or decomposed by Mother Nature. If you wait for nature to take its course, the smell can linger for weeks or months. It is most practical to find the body and remove it yourself. This may not be an easy task, but it will save you a lot of nausea down the road. If you don’t think you can locate the animal easily and with minimal damage to your home, there are professionals who will shoulder the responsibility for you. Many wildlife removers are also schooled in the duties of finding and removing animal remains. These experts will know how to interpret the smells and air currents within the home. Knowing where the smell originates from is a big part of removing the animal without undue damage to the interior of the building.